My current work usually requires me to work on a project until we can submit a research paper, and then move on to a new project. However, 3-6 months down the road, when the reviews for the paper return, it is quite common to have to do some new analyses or re-analyses of the data. At that time, I have to re-visit my code! One of the common problems I (and I’m sure many of us) have is that we tend to hack code and functions with the end in mind, just getting the job done. However, when we have to re-visit code when it’s no longer fresh in our memory, it takes significant time to decipher what some code snippet or function is doing, or why we did it in the first place. Then, when our paper gets published and a reader wants our code to try, it’s a bear getting it into any kind of shareable form. Recently I’ve had both issues, and decided, enough was enough!! #' match a particular keyword, e.g., mean, median, etc. My code above might not meet best practices, but it achieves two things for me. It reminds me of why I wrote this function, and tells me what I need to run it. This particular snippet is not part of any R package (though I could, with my new directory structure for projects, easily create a project-specific package if I need to). Of course this type of documentation is required if you are indeed writing packages. Update: As some of you have pointed out, the way I’m using this is as a fancy form of commenting, regardless of future utility in packaging. 100% true, but it’s actually one less thing for me to think about. I have a template, fill it out, and I’m done, with all the essential elements included. Essentially this creates a “minimal viable comment” for a function, and I only need to look in one place later to see what’s going on. I still comment my code, but this still gives me value for not very much overhead. There are several resources for learning about roxygen2. First and foremost is the chapter Documenting functions from Hadley Wickham’s online book. roxygen2 also has its own tag on StackOverflow. On the software side, RStudio supports roxygen2; see here. Emacs/ESS also has extensive roxygen2 support. The Rtools package for Sublime Text provides a template for roxygen2 documentation. So getting started in the editor of your choice is not a problem. I had a recent request to convert an entire folder of JPEG images into EPS or similar vector graphics formats. The client was on a Mac, and didn’t have ImageMagick. I discovered the Python Image Library to be enormously useful in this, and allowed me to implement the conversion in around 10 lines of Python code!!! To be sure, using ImageMagick is more powerful, and Python wrappers (PyMagick), albeit old, do exist. One of the disappointing problems in SAS (as I need PROC MIXED for some analysis) is to recode categorical variables to have a particular reference category. In R, my usual tool, this is rather easy both to set and to modify using the relevel command available in base R (in the stats package). My understanding is that this is actually easy in SAS for GLM, PHREG and some others, but not in PROC MIXED. (Once again I face my pet peeve about the inconsistencies within a leading commercial product and market “leader” like SAS). The easiest way to deal with this, I believe, is to actually create the dummy variables by hand using ifelse statements and use them in the model rather than the categorical variables themselves. If most of the covariates are not categorical, this isn’t too burdensome. I’m sure some SAS guru will comment on the elegant or “right” solution to this problem. Forest plots are most commonly used in reporting meta-analyses, but can be profitably used to summarise the results of a fitted model. They essentially display the estimates for model parameters and their corresponding confidence intervals. 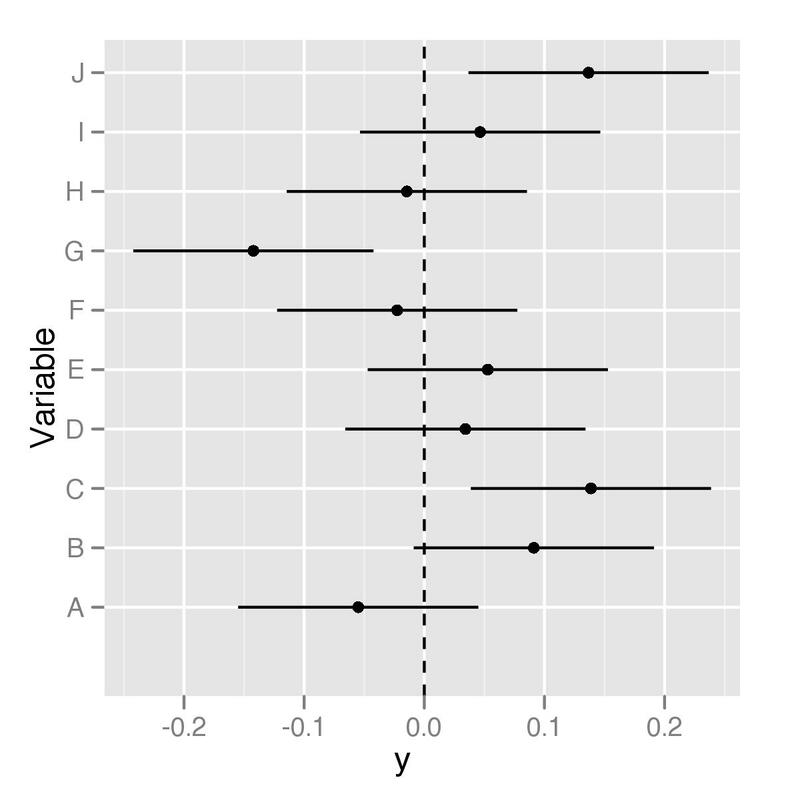 Matt Shotwell just posted a message to the R-help mailing list with his lattice-based solution to the problem of creating forest plots in R. I just figured out how to create a forest plot for a consulting report using ggplot2. The availability of the geom_pointrange layer makes this process very easy!! Update January 26, 2016: ggplot2 has changed a bit in the last five years. I’ve created a gist that will be easier to maintain. The link is here. The last fix obviously customizes ESS permanently for your emacs setup, while the first two allow you to get to underscore using the default ESS setup. ;; leave my underscore key alone! John D. Cook over at the Endeavour has a series of articles talking about floating-point arithmetic and how it can burn us in computing statistics like the standard deviation, correlation and regression coefficients using the book formulae. Specially enlightening for me was the trick of using the Taylor series expansion of log(1+x) for small values of x, since the error is actually quite small. Fantastic points, John!! I seem to be doing more and more with Python for work over and above using it as a generic scripting language. R has been my workhorse for analysis for a long time (15+ years in various incarnations of S+ and R), but it still has some deficiencies. I’m finding Python easier and faster to work with for large data sets. I’m also a bit happier with Python’s graphical capabilities via matplotlib, which allows dynamic updating of graphs a la Matlab, another drawback that R has despite great graphical capabilities. Where am I finding Python useful? Mainly in reading, cleaning and transforming data sets, and a bit of analysis using scipy. Python seems more efficient in reading and working through large data sets than R ever was. Data cleaning using the string utilities and the re module and exploration also seems pretty easy. I’ll probably have to right a few utilities, or just pass that stuff into R. I’m more comfortable doing the analysis within R, so I’m using rpy2 quite a bit. Gautier has done a nice upgrade of the old rpy which I used quite a bit. Speaking of report writing, this in another place I use Python a lot in my workflow to convert file formats. I use the Python API for OpenOffice.org to transform formats, both for Writer documents and for spreadsheets. I’ve written small Python scripts in my ~/bin so that I can, on the fly, convert HTML to odt or doc. This is proving quite useful and seems to preserve formats reasonably well. So my reporting workflow is to use Sweave to create a LaTeX document, which I then convert to PDF and HTML, and then transform the HTML to doc using Python. I also create all my graphics as PDF, EPS and SVG formats for subsequent editing by clients. These formats produce the least loss on transformation (the vector formats EPS and SVG have no loss), which is great for large, multicolored heatmaps I produce. I will also create PNG graphics if I have to provide a Word document for the client. A recent post on Walking Randomly gave a nice example of using the Python ctypes module to load Fortran functions that have been compiled into a shared library (*.so) or DLL (*.dll). This seems an easier option than using f2py or pyfort, which have not been working well for me.